Chris Weidman's shocking KO of Anderson Silva at UFC 162 wins our 'Finish of the Year'. When UFC 162 started no matter how close the odds were, no matter how many fighters were picking the upset, a general feeling still lingered in the air there was no way undefeated contender Chris Weidman was really going to finish the greatest fighter of all time, Anderson Silva. For months leading up to the fight, Weidman said time after time that he was the one that would end Silva’s historic unbeaten streak and title defense record inside the Octagon. The former All-American wrestler showed off his confidence in a first round that saw him take the champion down, work for aggressive submissions and put on a pretty dominant performance. But we’d seen this before. Silva had been goaded into bad first rounds before only to come back and annihilate an opponent later in the fight. The second round started off perfectly for the champ. He stuffed Weidman’s early takedown and as the challenger appeared to slow with an adrenaline dump possibly backfiring against him after a strong first round, the stage was set for Silva to unleash hell. When I watch it I remember being there and doing it. I remember thinking when I first did it thinking ‘that’s right buddy, that’s what you get, don’t know who you are thinking you’re doing that stuff to me! Instead, Silva used another age old tactic he became known for over the years. He started clowning Weidman, dancing around the cage, putting his hands down and inviting the top middleweight contender to hit him. So that’s what Weidman did, and with a quick series of punches ending with a left hook to the chin, Silva went crashing to the mat. A few shots followed, but it was already over — Chris Weidman just knocked out the iconic Anderson Silva. "When I watch it I remember being there and doing it. I remember thinking when I first did it thinking ‘that’s right buddy, that’s what you get, don’t know who you are thinking you’re doing that stuff to me!’," Weidman told FOX Sports about the knockout. "Then I continued to try and take my shorts off in front of millions of people. Like what am I doing? Then I was like I love Anderson Silva let me go help him up." Weidman’s victory stunned everyone in attendance and millions of people watching at home. The knockout will surely stand as one of the most memorable in MMA history, let alone 2013. 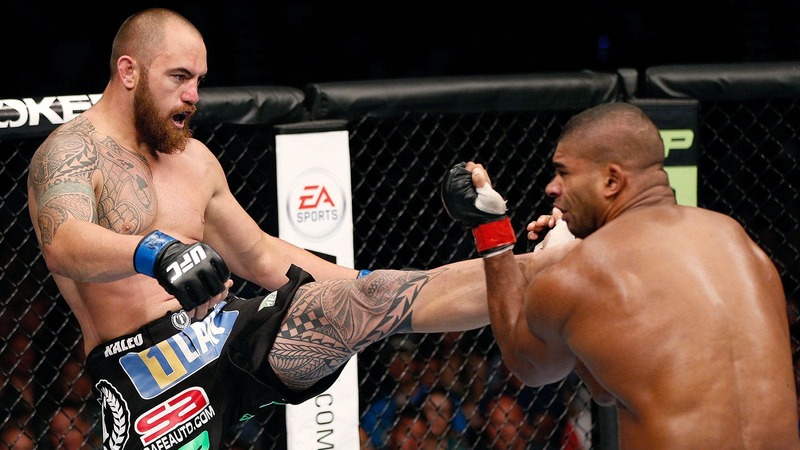 Travis Browne found himself in hot water during the first round of his fight against former K-1 champion Alistair Overeem. Browne got bombarded with strikes as soon as the battle began, and soon he was trapped against the cage with Overeem unloading a barrage of strikes that probably would have finished any heavyweight in the world. Except that night he couldn’t put Browne away, and a few seconds later the Hawaii native uncorked a front kick that landed right in Overeem’s mush. The Dutch striker crumbled to the mat and Browne celebrated one of the best comebacks of the year not to mention one of the best finishes. Mark Hunt is known best for two things - insane knockout power and the ability to absorb punishment like a sponge with a head made out of concrete. 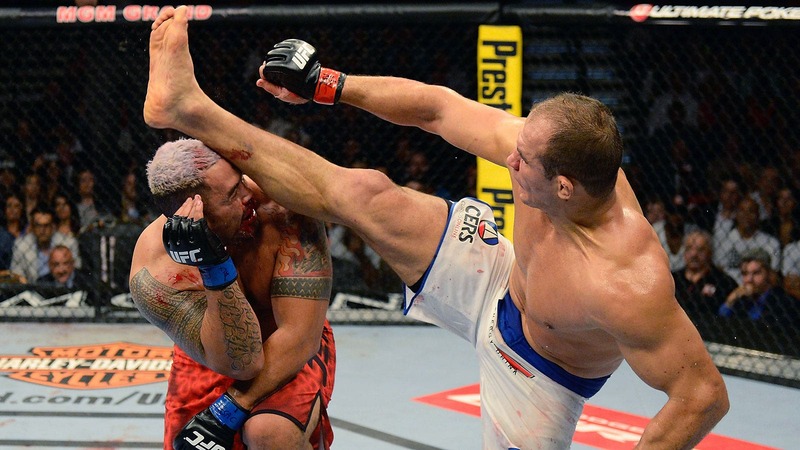 Former UFC heavyweight champion Junior Dos Santos decided to test out Hunt’s chin when they battled back in May, and the result was nothing short of spectacular. Dos Santos, already up on the scorecards, still fired away at Hunt even in the third round with less than a minute to go in the fight. It was at that moment that Dos Santos decided to twist his body around and toss a spinning wheel kick and as his heel bounced off of Hunt’s head, the eyes of everyone watching got as big as saucers. Hunt fell to the mat and Dos Santos celebrated not only finishing one of the toughest guys in MMA history, but doing it in spectacular fashion. Vitor Belfort has always been a top middleweight, ever since he decided to make the move down to 185 pounds. But lately he’s gone from being one of the best to an absolute terminator inside the Octagon. He head kicked Michael Bisping and knocked him out. He did a spinning back kick to crush Luke Rockhold, but Belfort’s biggest accomplishment in 2013 was doing what no other fighter had ever done in almost 40 pro fights. Belfort obliterated MMA legend Dan Henderson in just 1:17, and finished the job with another head kick to become the first fighter to ever knockout the former Olympian. It was a jaw-dropping performance to say the least.